At 8 pm on March 29th, 2008, lights and non-essential appliances will be turned off all around the world for one hour, demonstrating how simple actions can make a real difference when everyone participates. Even one light makes a statement and you can make a difference! 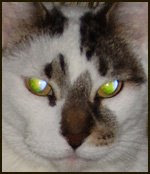 At Eclectics, we'll be telling ghost stories by the light of Bookshelf Cat's glow-in-the-dark eyes. How 'bout you? Visit Earth Hour and on Saturday night, flick off! Bookshelf Cat will be sharing Earth Hour stories aboard the Friday Ark this weekend. Part Five of the online serial by Erin McCarthy and Kathy Love is online now at The Impalers Vampire Band web site. I don't see a bunny. Do you see a bunny? 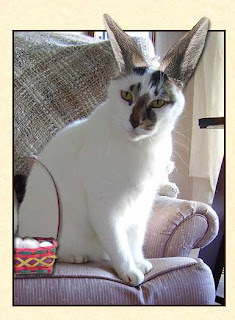 Happy Easter and joyful springtime greetings from Eclectics and the Bookshelf Bunny Cat (who absolutely did not authorize this photo). Hop on over to the Friday Ark for more spring frolicking. Number 1 on the New York Times list! Congratulations to Eclectics author Victoria Alexander, whose novel The Perfect Wife is currently the #1 mass market paperback on the New York Times Bestseller list! The book is #4 on Publishers Weekly bestseller list and #65 on the USA Today list. Visit Victoria Alexander for a preview. In the early 1870’s, the young state of Texas was struggling to survive. Its vast, undeveloped land of over 260 thousand square miles became a haven for the lawless. Murderers, rustlers and renegade bands of hostile Indians and Comanchero roamed the vast wastelands of west Texas with only a narrow river separating them from the sanctuary of Mexico. One group of dedicated lawmen stood between this element and the law-abiding citizenry—the Texas Rangers. This is the story of one of those men. 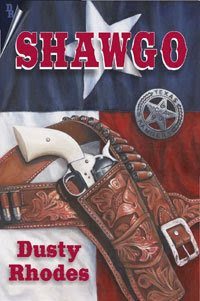 Shawgo—Texas Ranger. Visit Dusty Rhodes for an excerpt and ordering information. Shawgo is available now! 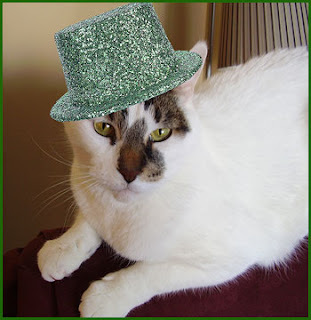 Bookshelf O'Cat wishes you a happy (early) St. Patrick's Day! 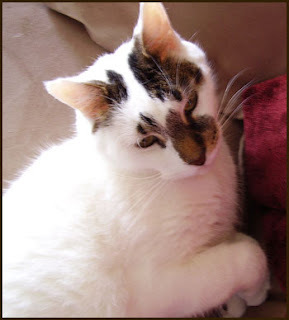 Look for other happy cats aboard the Friday Ark. Visit Laura Joh Rowland to meet the characters and read an excerpt, or buy a copy now! Join author Barbara Colley for a discussion of her latest Charlotte LaRue Mystery, WASH AND DIE, book seven in the 'Squeaky Clean' series, at the Jefferson Parish East Bank Regional Library, 4747 West Napoleon Avenue, Metairie, Louisiana. For information, visit Jefferson Parish Library. Novelist Laura Joh Rowland (author of the Sano Ichiro mystery series) signs her new book, THE SECRET ADVENTURES OF CHARLOTTE BRONTË, an epic, world-at-stake thriller starring the legendary 19th century author and her equally famous family, at Octavia Books, 513 Octavia Street, New Orleans, Louisiana. Visit Octavia Books for details. Bookshelf Cat enjoys a bedtime story. Look for more drowsy cats at the Friday Ark. Barbara will be reading and signing her latest, Wash and Die, this Friday afternoon beginning at 4:00 p.m. If you're in Monroe, Louisiana, come out and see her at Windows: A Bookshop, 609 Park Avenue. For more info, phone 318-361-9004. Erin is the guest speaker at this month's meeting of the Florida Romance Writers in Ft. Lauderdale. This is a ticketed event and reservations are required. Visit Florida Romance Writers for details. Moira Hughes’s stepfather has died, and although the bulk of the family holdings must pass to a relative, a codicil to his will secures her and her mother’s future – or so she believes. When their London solicitor denies all knowledge of this codicil, practical, country bred Moira must put aside both pride and propriety, travel to London and press her rights. Once there she resolves to confront her stepfather’s heir, the dashing black sheep of the family whom she believes has unlawfully withheld her rightful share of the family fortune. 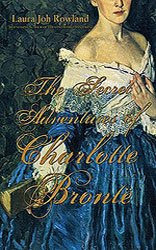 Coming to a wary truce and teetering on a middle ground of irresistible if imprudent desire, Graham and Moira team up to hunt for her lost treasure. A trail of fraud, deceit and murder leads them through the streets of London and into each other’s arms, and to the most unlikely of conclusions. 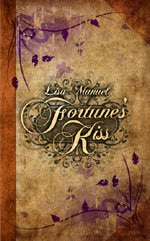 Visit Lisa Manual to read an excerpt of Fortune's Kiss - available today!